“A Christmas Story, The Musical” celebrates Jean Sheperd’s beloved regional favorite and movie classic. Set in the fictional 1940s town of Hohman, Indiana, the story follows 9-year-old Ralphie and his quest for the Holy Grail of Christmas gifts, an official Red Ryder carbine-action 200-shot Range Model air rifle. All the iconic scenes from the movie are here: Flick getting his tongue stuck to the flagpole, Randy getting dressed in his snowsuit, the bullies Farkus and Dill, the leg lamp award, the bunny suit, the Chinese restaurant, Christmas dinner and others. November 24 through December 10 at the Memorial Opera House, Valparaiso. 219/548-9137 or www.memorialoperahouse.com. Maestro Kirk Muspratt celebrates the Symphony’s 75th birthday with Santa. 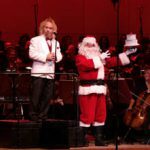 The Northwest Indiana Symphony bids a fond farewell to the Star Plaza Theatre, its home for the past 35 years, with the final Holiday Pops concert to be performed at this iconic venue on Thursday, December 7 at 7:30pm. Get into the spirit of the season with one of Northwest Indiana’s most popular holiday treats. Hear a combination of contemporary and classic holiday music. Sing along with the Symphony Chorus to beloved carols and keep an eye out for Santa as he checks in on the Maestro. The Hobart String Orchestra and Crown Point High School Chorale will delight. It’s a South Shore holiday tradition! Last year’s Holiday Pops sold out with more than 3,000 people in attendance. Join the Symphony’s 76 Trombones Club with a donation of $76 per person/$152 per couple and come to a special farewell at the Star Plaza Theatre event before the concert, where you can mingle with Maestro Muspratt and members of the orchestra while enjoying hors d’oeuvres, Symphony cookies and the Jeff Brown Trio. 219/836-0525, ext. 200 or www.nisorchestra.org. Theatre at the Center at Munster’s Center for Visual and Performing Arts has scheduled three events to celebrate the holidays. “It’s a Wonderful Life” by Pulitzer Prize and Tony Award-winner Sheldon Harnick (“Fiddler on the Roof”) captures the magic of the classic Frank Capra holiday film, November 16 through December 23. George Bailey’s Christmas Eve is transformed by an angel eager to earn his wings by showing the guiding influence one person can have on others. On December 29 and 30, “A Very Electric Christmas” tells the story of Santa putting the finishing touches on the presents while meeting some new friends who have gotten lost at the North Pole. This heartfelt story is great for children of all ages and families alike. Ring in the New Year on December 31 with The Four C Notes, the only tribute group for Frankie Valli and the Four Seasons in the Midwest! 219/836-3259 or www.theatreatthecenter.com. Click to read more from the Fall 2017 issue of Northwest Indiana Business Quarterly.